Well before his untimely death on July 11, 2010 at fifty-five, Robert Sean Brazil had become one of the most formidable Oxfordian researchers and writers. 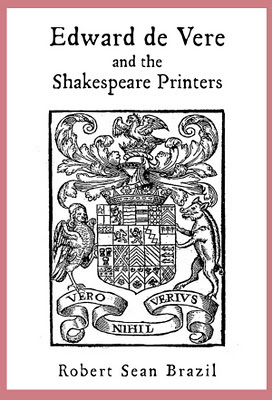 Back in 1999 he had printed up copies of a work-in-progress called The True Story of the Shake-speare Publications: Edward de Vere & the Shakespeare Printers, now available online at Amazon. 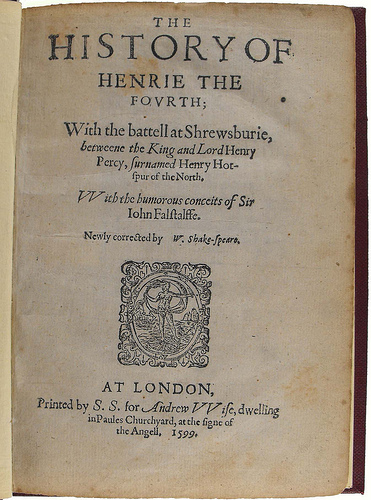 And among the many facets of this single work is one of the strongest pieces of evidence for Oxford’s authorship of the Shakespeare poems, plays and sonnets. Brazil observed, quite simply, that “Shakespeare” personally edited some of his own works – at least five of them, according to statements on their title pages. 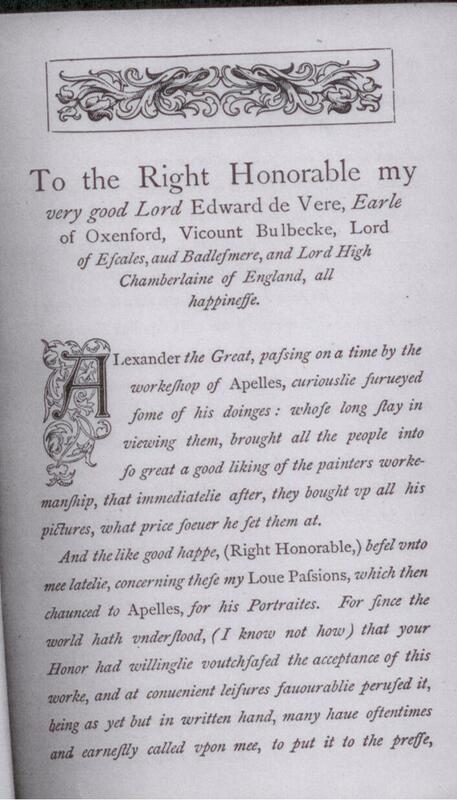 The printers of these five quartos indicated or implied that the author himself had altered or enlarged the plays for publication, even after they had been performed at court or in the playhouse. Within the Stratfordian story there is no reason why the author would disappear from the publishing world in 1604, at the peak of his renown, and live in invisible retirement for twelve more years until his death in 1616. In the Oxfordian scenario, however, the reason “Shakespeare” was out of the loop after 1604 is that Edward de Vere died (or disappeared from England) that year. Contrary to the traditional teaching that Shakespeare had no control over his play texts and no interest in them once they were sold to a publisher, here we have a procession of five different title pages, each indicating that the author had taken an active editorial role. Moreover this procession begins with the very first printing of the Shakespeare name on a play and it ends abruptly after Oxford’s departure. 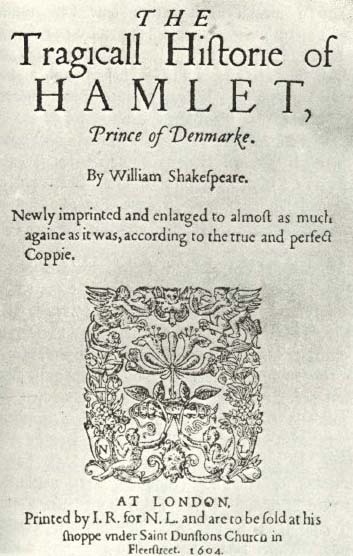 The name is hyphenated, separating “Shake” and “speare” — indicating to readers that it’s likely a pen name. 1599: Romeo and Juliet: “Newly corrected, augmented, and amended: As it hath been sundry times publicly acted, by the right Honorable the Lord Chamberlain his Servants … London, Printed by Thomas Creede, for Cuthbert Burby.” Oddly enough, despite the corrections, augmentations and amendments, the author’s name is missing! This is issued by Cuthbert Burby, who published Love’s Labour’s Lost and surely knew who the author was. And the name is missing despite the fact that Shakespeare’s two narrative poems, Venus and Adonis of 1593 and Lucrece of 1594, both carried his name (on the dedications to the Earl of Southampton) and were bestsellers. 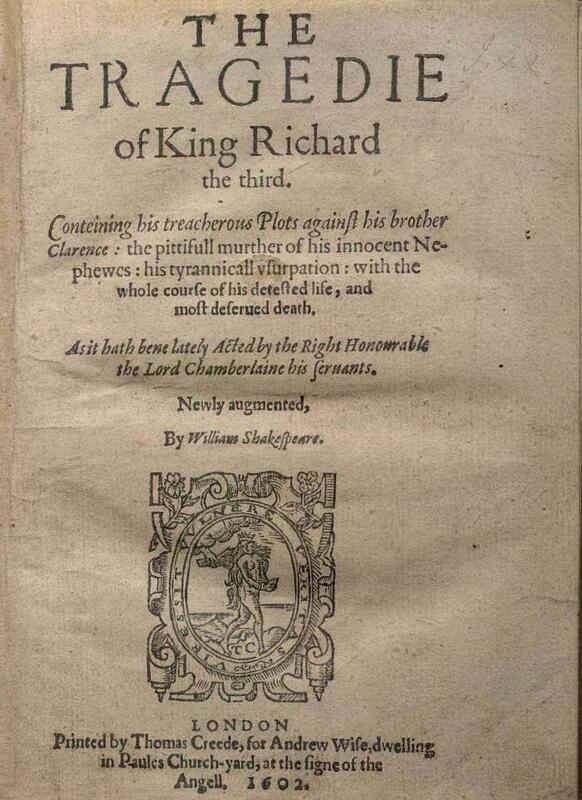 1602: Richard III: “As it hath been lately Acted by the Right Honorable the Lord Chamberlain his servants. Newly augmented by William Shakespeare. 1604: Hamlet: “By William Shakespeare. Newly imprinted and enlarged to almost as much again as it was, according to the true and perfect copy. Oxford’s name and talent “were either on display or being praised overtly” in more than eighty books (including reprints and revised editions) while the earl was alive, Brazil writes, naming twenty-three printers or publishers associated with “Oxford’s Books.” Of these, he takes special note of nine men who were also printers or sellers of Shakespeare quartos: Thomas Creede, Richard Field, Cuthbert Burby, Peter Short, James Roberts, Simon Stafford, Edward White, John Danter and John Harrison. 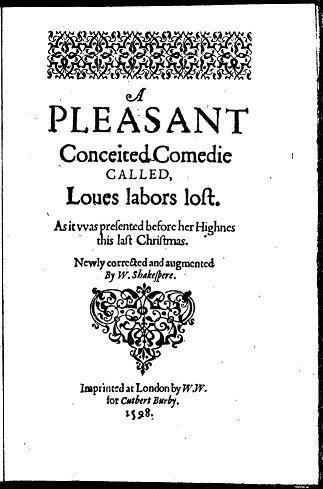 One of the “peculiar facts” that Brazil observed was that Cuthbert Burby, who published Love’s Labours Lost in 1598, also in the same year published Palladis Tamia by Francis Meres, the book that praises Oxford among those who were “best for comedy” while announcing that “Shakespeare” (without the first name) was not only a poet but the author of twelve plays including Love’s Labours Lost and, among the others, Romeo and Juliet. But the “peculiar” part of this story is that Burby, when he went on to publish Romeo and Juliet in 1599, failed to give credit to “Shakespeare”! The first edition of Romeo and Juliet, a “bad” pirated version published in 1597 by John Danter, says nothing about Shakespeare. 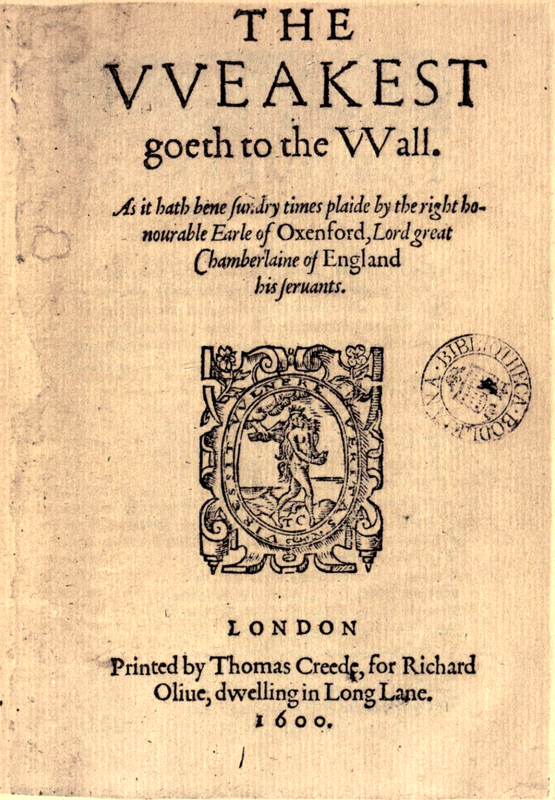 Burby’s edition in 1599 (the second quarto) contained a much better text (perhaps obtained by his printer, Thomas Creede, who had connections to Oxford), but it still carried no Shakespeare name. 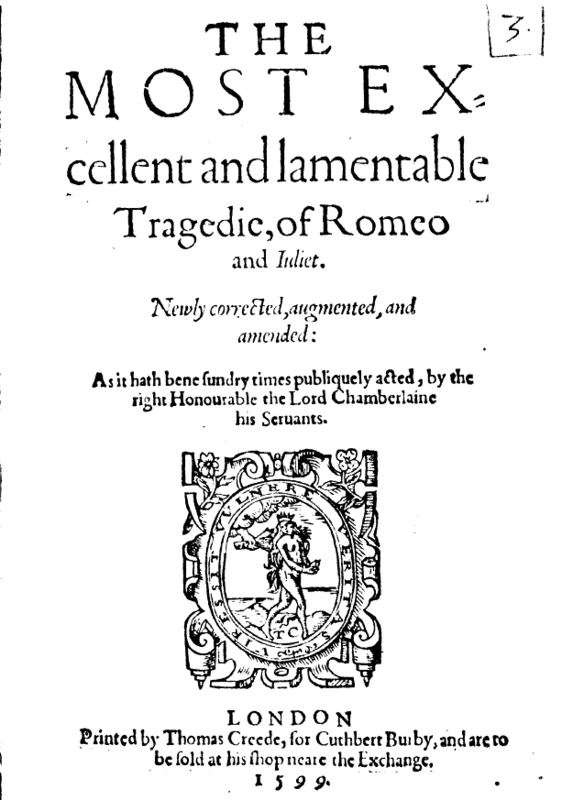 Even though Burby had published Palladis Tamia the year before, claiming Romeo and Juliet as a Shakespeare play, he failed to credit any author at all! And that someone, given the evidence, was Oxford. Another case study centers on James Roberts, who, Brazil discovered, printed no less than five editions of books that featured Edward de Vere in some way: Gwydonius Card of Fancy Q2 by Robert Greene, 1587; Paradise of Dainty Devices Q7, 1600, with some of Oxford’s early poetry; Euphues and his England Q8, 1597 and Q9, 1601, as by John Lyly, dedicated to Oxford (the two editions counted as two books); and England’s Helicon, 1600. I find this very compelling. However, and my scholarship is scattered and poor, not recent: who was Shakespeare of Stratford, then? 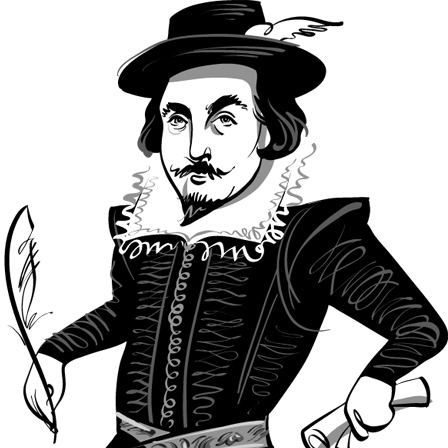 If tax records, etc., indicate that William Shakespeare was an actual person, connected with his glove maker father, the wool trade of the area, Catholic culture, the local school, is that simply the source of the confusion, or is there a deliberate confusion on the Earl of Oxford’s part to mask his identity by using a known actor and the Elizabethan word games/culture? Who are these two men in relation to each other? It was noble and to me moving that Robert Brazil’s family and hometown friend, Jefferson Foote now living and working in Washington State, saw to it that Bob’s unpublished manuscripts, Edward de Vere and the Shakespeare Printers, which you mention, and Angel Day: the English Secretary were published. They are invaluable, virtually untapped, sources of evidence for the Oxford authorship. Not only did he lay out the printer and publisher relations with Oxford, but also the ornaments and Latin epigrams that communicated the (unprinted) author. To help Hank sum up an entire topic (where does Shakspere fit in?) in a paragraph for Liz Grier, it is no exaggeration to say that the Portrait and the Jonson dedication and eulogy were critical elements of a political and historical plan by de Vere’s heirs to immortalize the work while putting the true author into tragic but discreet eclipse. The First Folio could have been collected and burned otherwise. Insinuating a bogus author ad hoc, clandestinely carving a bogus Stratford plaque together manufactured a fictive artist-persona that survived generation upon generation in a confused history few dared to disturb because it was officially sanctioned. One the net of lies got going, no one within it could untangle and figure out what had happened. Hence the rather unwelcome “Amateur” scholars who have broken up the clay idol. Also, did Oxford find the perfect name which punned with his 1580’s epiteth (Spear Shaker) thanks to the editor of “Venus and Adonis”? It’s a web, I think, like the spider’s web; a web of paper trails, printers, publishers, writers, pen names — and it will come clear one day. Regarding Roberts and Hamlet. Robert Detobel did a lot of research on this and figured out the problem of publishing, which no traditionalist had ever done. In 1588, in order to protect authors, a clause was put in the ordinancen (paragraph 5) stating that if a piece of work was held for 6 months without printing, ONE copy or impression could be made by another printer or publisher. This was done to stop publishers and printers from holding writers hostage. What is interesting is Shapiro did a fine job in deconstructing Q2 from Folio. The author never intended Q2 to be the final version. The character overwhelms the play and certain really fine speeches (Dram of Eale, one soliloquy, among others) are dropped. But Q2 is far more the copy the author wanted than the shortened and believed to be by many (see Sams) earlier version of the play. without lycence first had from the Right honorable the lord Chamberlen”. MOV was NEVER printed until Folio. This last sentence set off a firestorm at the Conference in Portland. Detobel argues this is a smoking gun as only the author (Lord Chamberlain-Oxford) could dictate this. Strats argue it was Hunsdon. How or why Hunsdon would interfere is completely unclear. Or why Hunsdon would take control to publish the “true and perfect copy” and be bothered with it in the first place. Corrupt versions of Shakespeare’s works appeared often. He is the most pirated author of his time. I think over 80% of pirated editions were his. Usually only dead authors or noblemen were pirated. Where was Shakespeare of Stratford in all this? He seemed obsessed with money. Why was he letting others profit off his work? He sued people in court for far less. Heywood didn’t let people do it. And then later it would seem he was the most “forged” author in terms of documents about his life. I am not sure of it, but as we’ve said before, the forgeries were possible because of the vacuum of biographical material; and who could contest anything, since nothing was known in the first place? And yes, the corrupt versions were possible back then because of another kind of vacuum, as you say, no one to strike back.